NEW YORK -- Nationals right-handed Minor Leaguer Zech Zinicola was suspended Thursday after testing positive for a drug of abuse a second time. The Office of the Commissioner of Baseball announced that Zinicola had received a 50-game suspension after a second violation of the Minor League Drug Prevention and Treatment Program for a drug of abuse. The ban will be effective at the start of the 2012 season. The 26-year-old Arizona State product went 3-0 with a 2.01 ERA in 32 outings for Double-A Harrisburg and Triple-A Syracuse last season, collecting five saves in 40 1/3 innings. He most recently pitched for Hermosillo in the Mexican Pacific Winter League, where he was 1-1 with a 2.37 ERA in 16 appearances through Nov. 26. Under the Minor League drug program, players are typically suspended after a second failed test for a drug of abuse, or a non-performance-enhancing substance; a first positive test results in a warning and continued testing. The Commissioner's Office did not disclose Zinicola's specific violation. Zinicola told MLB.com that the positive test result may have come from his use of synthetic marijuana. "I got done playing winter ball and I decided to have a little fun," he said. "I tried out this synthetic marijuana. I tried it a few times ... and I got drug tested. It's pretty much what it is. I take responsibility for it. There is no excuse." The 6-foot-1 right-hander was the Nationals' sixth-round pick in the 2006 Draft and has split the last three seasons between Double-A and Triple-A. The Loma Linda, Calif., native was initially drafted by Atlanta in 2003 but did not sign. Toronto drafted him in the 2010 Rule 5 Draft, but he was returned to Washington last March after he failed to make the Jays' Opening Day roster. "They wanted to have him back," Toronto general manager Alex Anthopoulos said in March. "I told Zech that's a good thing for him. They wanted him back. Hopefully he's going to get an opportunity there and they like him. From a selfish standpoint, we would've loved to have kept him. But we still care about the person and Zech was first-class when he was here." 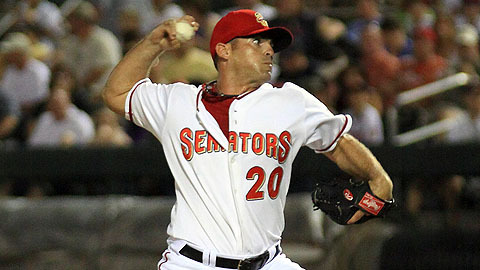 Zinicola becomes the first player in 2012 to be suspended under the Minor League program.